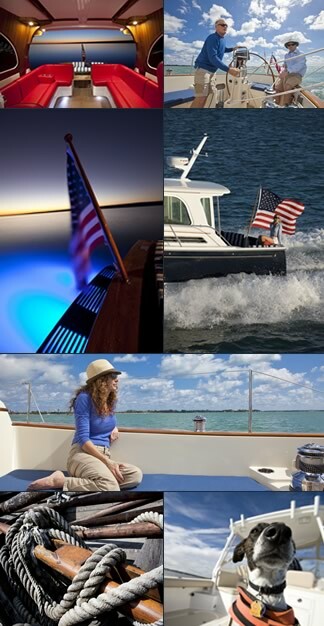 Latitude Yacht Brokerage | Make RI Your Boating Home! For nearly twenty years, Rhode Island hasn’t charged a sales tax on boats that are delivered and registered in the State. While many neighboring states have increased their Sales Tax rates and expanded that levy on more and more products, Rhode Island – the Ocean State – has left in place its exemption of NO SALES TAX ON BOATS…for residents and non-residents alike. Boating is so important to the economic life of Rhode Island, the State Legislature recognizes the value of attracting more and more boaters to our shores. If you stay in another State for a too-long visit, you might be liable for a sales tax from them. That’s up to the other States. But, as long as you enjoy the beautiful boating of Narragansett Bay and Rhode Island Sound, you won’t have to pay a sales tax here if you take delivery on your boat in Rhode Island and register it here! The Rhode Island Sales Tax exemption for boats also applies to services you have done to your boat in RI or the mooring and storage you enjoy in RI. There’s NO SALES TAX ON BOATING SERVICES! Repair it, refit it, store it for the Winter or keep it at a mooring or slip at a Rhode Island marina or boat yard and your won’t pay a Sales Tax on anything but parts and products used. And, you don’t even have to have your boat registered here. We want you to see how great it is to do your boating in Rhode Island and you don’t have to pay the State for the privilege! For people in Massachusetts, Rhode Island can be the most convenient place to moor, store or service their boats. In Connecticut, RI is the closest place to enjoy both bay and ocean boating . And, with our convenient airports, highway and train connections – with marinas, slips and services facilities just a short cab ride away — the Ocean State is often the first choice for a weekend or a season of boating from anywhere in the world! According to the Rhode Island Sales Tax law, the State does not impose a Sales or Use Tax on boats or boating services AND does not allow any city or town to charge a property tax on boats…so you won’t get hit with a tax year-after-year on top of the sales tax, both of which are charged in many other States. It’s wonderful to live along Rhode Island’s coast — and your house and car will get taxed like most other locations — but, live here or even in another State and your boat in RI won’t get taxed like it may be if you left it at home. With beautiful Rhode Island waters, convenient marinas and service facilities, skilled workers and craftsmen available to take care of your boat, and no taxes if you keep your boat here or just have it stored or serviced, it makes sense to “Make RI Your Boating Home”. Join the people from out-of-State who account for 46% of the tenants at slips and moorings in Rhode Island already. Go to www.RIMTA.org and click on the Member tab to get a list of places where – like them — you and your boat can find a great Rhode Island Home.